experts on climate change agree that cost-effective technologies are available to stabilise emissions of greenhouse gases (ghgs) like carbon dioxide, nitrous oxide and methane at a low level, but there is a need to initiate major policy changes to make such a transition. Delegates from about 85 countries met in Accra, Ghana, from February 28 to March 3, 2001 to review existing technologies and measures, which can decrease dependence on fossil fuels and help combat climate change. A report released at the meeting was the third in a series of assessments undertaken by the Intergovernmental Panel of Climate Change (ipcc), an influential body of scientists and experts on climate change. The first report discussed potential changes in climate as a result of global warming, while the second one elucidated the impacts of such changes on various countries. Climate change experts also noted that the past five years have seen unexpected progress in development of alternate technology to curb ghg emissions, like wind power and fuel cells. Moreover, it is now possible to achieve increased efficiency of hybrid engine cars, end use devices and energy conversion technologies, which can go a long way in stabilising atmospheric ghg concentrations at a safe level. However, they fear that if countries continue to depend on abundant resources of fossil fuels such as coal and oil, whose combustion releases ghgs, it would become difficult to limit carbon emissions during the 21st century resulting in devastating effects. They further pointed that present incentive system with subsidies on fossil fuels encouraged resource-intensive production and consumption patterns leading to increased ghg emissions from all sectors. ghgs by virtue of their ability to trap heat reflected from the Earth's surface cause global warming resulting in unwanted changes in climate. Since the advent of Industrial Revolution, the world's reliance on fossil fuels like oil and coal has increased leading to a phenomenal rise in ghg concentrations in the atmosphere. A controversial issue dealt by the experts is that of biological mitigation using sinks. The report concedes that forests, agricultural lands and other terrestrial ecosystems -- commonly referred to as sinks as they absorb carbon dioxide -- are not permanent ways to deal with ghg emissions. It also warns that conservation and sequestration may result in substantial quantities of carbon being stored, but can lead to higher carbon emissions in future if these ecosystems are severely disturbed by either natural or human-induced disturbances. Additionally, if not implemented properly, such activities may threaten biodiversity, pollute groundwater and disrupt the lives of local dwellers. However, such ways to reduce ghg concentrations may allow time for other options to be further developed and implemented. 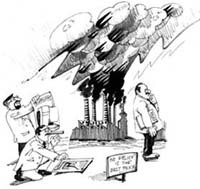 usa, Canada and Japan's insistence on the use of sinks to meet emission reduction targets as stipulated under the Kyoto Protocol was a key reason behind the failure of the last round of negotiations on climate change in November 2000. According to estimates, subtropical and tropical regions present the largest potential for such conservation and sequestration activities. Moreover, it is a lot cheaper to undertake such activities in tropical countries (us $0.1 for each tonne of carbon) as against non-tropical countries where the cost could be as high as us $100 per tonne of carbon. Estimating the possible cost incurred by industrialised countries in decreasing their emissions, the report says that it is equivalent to a reduction of 0.2 to 2 per cent in projected gdp in 2010 when emissions trading mechanism is not allowed. This mechanism allows countries with Kyoto commitments to trade in assigned amounts (the maximum quantity of ghgs that a country is allowed to emit under the protocol). If full use of the mechanism is permitted, the costs drop by as much as 50 per cent. In fact, the drop is even more if additional benefits, like reduced air pollution, are considered in the cost estimates. Exhorting countries to undertake reductions immediately, the report says that about 50 per cent of the potential emissions reductions, which can be undertaken by 2020, may be achieved with benefits exceeding operational and maintenance costs and countries can actually make profit. The remaining, though, would require a net direct cost of up to us $100 per tonne of carbon equivalent (at 1998 prices). End use energy efficiency in buildings, transport and manufacturing industries can account for more than half of potential ghg emissions reductions in the next 10 to 20 years. The report also talks about the much controversial nuclear power's role in averting climate change in a favourable manner. This has prompted environmental organisations like Greenpeace to call the report as positive in its entirety but for such elements.